Remember your old handbags? 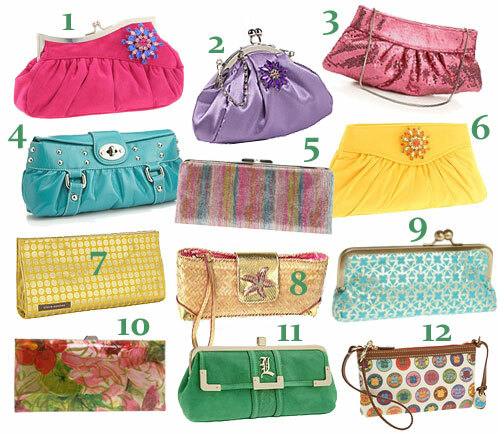 Remember the days when clutches were an option? 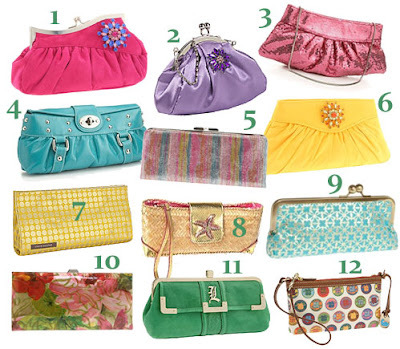 The days when you had the leisure time to match a purse to an outfit? Designs and fabrics and strap length to be determined at your whim? And all you needed inside that purse? A bit of money, a license, a credit card...maybe. Your keys. Some emergency lipgloss. A travel perfume, perhaps. The purse is one of those frivolous little privileges you never appreciate or even know you're going to lose when you hit motherhood. These days my purses are all huge. They're glorified diaperbags, really. And it's not just a size issue. Remember white purses? 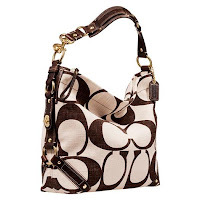 Designer purses? The days when you could wear one of these without food being splattered on them, or little hands wiping dirt on them, or tearing at them. The days when purses kept their shape and new quality for months, maybe years, because you had the time and the inclination to take care of them and treat them gently? No more. Since my children were little, I've need my purse for its utility, not for its design. It's become a magical den of tantrum-stoppers, hunger-easers, and cleaner-uppers. I usually even have extra clothes and shoes in there, and an emergency diaper or two...just in case. Towels, tissues, an extra barrette to replace the one you lost on the playground. A juice box, a cereal bar...wait. An exploded juice box and a smashed cereal bar? Oh for God's sake. My purse, it's seen better days. I'm not going to take a photo of it. 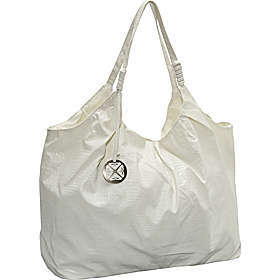 Instead, I'll show you a really ugly (in my opinion) purse that has all the qualities a mother needs. Hopefully you can find a prettier version. 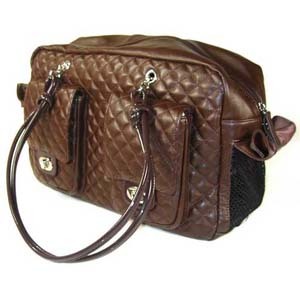 I chose this one because it was actually labeled dog-in-a-purse, so you know it must be pretty big. That's the first requirement. You're going to need a big handbag, if that's the only thing you're going to be lugging around. You'd be amazed at what you "need" to put into it. I need to put everything into it because with both my hands holding baby hands wherever we go, I can't carry anything any more. Secondly, get a dark color. It's going to get dirty at the park, it's going to get food on it at the restaurant, it's going to be stepped on and thrown about and rifled through during that one second you weren't looking. It needs to be able to camouflage these abuses. Third, it needs outside pockets that can close and seal. With all the junk in there, you'll need a place for your keys so you can easily find them without ripping the whole thing to shreds. You'll want a place for your cellphone outside of the purse. There is nothing worse than exploded grape juice on a smart phone. Adjustable straps would be a plus, in case you want to switch shoulders, or you're carrying a toddler or two and need to strap the purse around your back so it doesn't slide off. Are any of these things pretty? Not particularly. But Mary Poppins' carpet bag was hideous, and she still looked styling. It's all in how you wear it. I have this thing, it is amazing. The Coach pattern somehow manages to hide all the stains. Evie pulled my diet coke off of the table and right into my bag within the first week of having it and it still looks fabulous. It comes with a changing pad and an adjustable strap that you can take off and on. Sure, it's not some cute little clutch but it's still prettier than Mary Poppins's carpet bag.